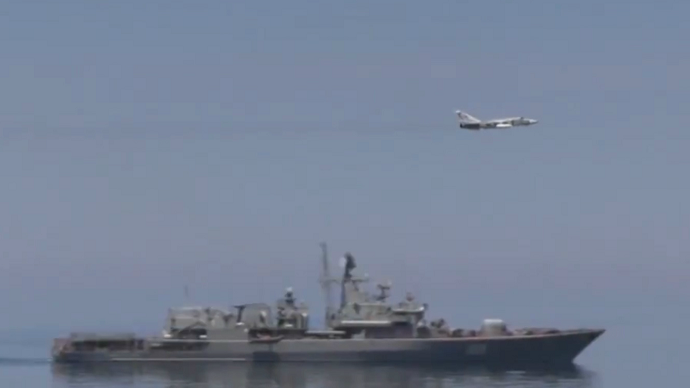 The US 6th Fleet has made public a video which is described as showing the Russian jet interaction with the USS Ross warship in the Black Sea on May 30. The video was shot aboard the sea vessel. “[USS] Ross continued on her mission after observing the aircraft return to base. At no time did Ross act aggressively nor did she deviate from her planned operations. The conduct of her crew has been and continues to be professional. Ross’ Sailors observed that the SU 24 carried no weapons – wings were ‘clean,’” the statement added. However, according to a source in the Russian armed forces, cited by RIA Novosti news agency: “The crew of the ship acted provocatively and aggressively, which concerned the operators of monitoring stations and ships of the Black Sea Fleet.” That was the reason why the Russian jet had to be scrambled to warn off the ship near Russian waters, the source said. Saturday's incident is the latest in a series of border surveillance confrontations between Russia and the West. Europeans, especially the Baltic States, have repeatedly scrambled their jets saying Russian aircraft were coming close to their borders. The Americans operate several warships in the Black Sea, close to Russia’s naval bases. This includes NATO vessels operated by US allies, which keep showing up in the region.